After two years in business, Keller Williams San Francisco is poised for continued growth in 2018. 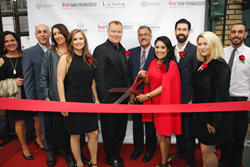 Wendy Davis, Team Leader of Keller Williams San Francisco, cuts the ribbon at the Nov. 3 grand opening ceremony of the company's third San Francisco office. From owners to partners to investors, we’re all committed to helping our agents grow and making a difference in people’s lives. We’ll continue to focus on following through with that commitment, and we’re thrilled about all the plans we have in store for 2018 and beyond. Through its innovative profit share program, Keller Williams San Francisco has distributed more than $100,000 to associates who have helped the company grow in 2017. Over the course of 2017, the real estate brokerage opened a new state-of-the-art office and saw its total agent count grow to more than 150 agents, closing over 700 units. That equates to an 80 percent increase over last year’s closed units, leading to a sales volume of $808.2 million. A testament to the impact of Keller Williams San Francisco’s training and coaching programs, headed by Team Leader, Wendy Davis, a number of individual agents and real estate teams have posted significant increases in production in 2017. Michael Minson, Owner and Senior Listing Specialist of Level Up Group SF, saw his team’s closed sales volume jump 94 percent over last year, while his team grew from four to 10 members strong. In his upcoming Jan. 26 seminar, Michael will discuss how he has grown his total production numbers from $0 to $200 million over a five-year period with Keller Williams. Four Bridges, another up-and-coming team under the Keller Williams San Francisco umbrella, saw their total sales volume increase by more than 75 percent in 2017. Additionally, Roh Habibi, an agent who is just beginning to build his team, saw his sales volume increase by 114 percent. Named 2017’s top training organization across all industries by Training Magazine, Keller Williams offers curriculums for seasoned agents as well as those who are just starting their real estate careers. Wendy Davis coaches the company’s top producing agents, while newer agents have access to a comprehensive one-on-one coaching program. The new agent coaching program, led by Radha Tomassetti, a top producing agent for the last 17 years, as well as Blanca Aguirre, a broker with more than 20 years of real estate experience, has also made significant strides in 2017. Notable rookie agents at Keller Williams San Francisco, Hayley Kerstein and Andreas Ernst, both joined teams in 2017 and brought in impressive sales volumes of $20.3 million and $8.7 million respectively. With seven years as a Keller Williams Team Leader and Coach, Wendy Davis was handpicked by Regional Owner and Operating Principal, Rick Cunningham, to head up the San Francisco office. Since beginning the role in Feb., 2017, Davis has overseen rapid growth, as her entrepreneurial and leadership skills have attracted high-quality agents. In addition to continued growth in residential sales in 2018, Keller Williams San Francisco will focus on growing its newly launched Luxury, Leasing and Relocation, New Construction, and Commercial divisions. “With our new divisions, we plan to be one of the most versatile brokerages in the Bay Area, having the ability to serve our agents and their clients, no matter what type of real estate they’re interested in,” said Davis. On a global level, Keller Williams Realty International has pledged to invest $1 billion in technology to fund everything from customer development to strategic acquisitions. Along with this fund, the company has launched a “labs” product to help test new technologies in the field with Keller Williams agents and their clients. Keller Williams remains the largest real estate brokerage in the world by associate count, and the company recently surpassed $1 billion in profit share distribution since the program’s launch in 1997. Through the profit share program, individual Keller Williams market center owners share close to 50 percent of their office's monthly profits with associates who have contributed to growth. Due in part to the profit share program, Keller Williams Realty International secured top spots on some coveted year-end lists, including a number one rank on CareerBliss’ 50 Happiest Companies in America and a 13th place ranking on GlassDoor’s 2018 Best Places to Work. Keller Williams is a growing force in San Francisco’s unique housing market. Known for its international presence and frequency of successful business transactions, the company’s mission is to employ the highest quality real estate agents to provide clients with the best real estate experience. On a national level, Keller Williams Realty International holds the coveted “triple crown”--number one among all brokerages in associate count, number of transactions, and sales volume. After two years in the city, Keller Williams San Francisco has seen extraordinary growth. Since the start of 2017, the brokerage has increased its closed sales volume by 80 percent, its number of listings sold by 88.7 percent, and the total number of producing agents by 123 percent. The company now has three office locations in San Francisco. Over the past 12 months Keller Williams Realty International has sold $295 billion worth of real estate worldwide. It has served the community’s needs in residential, luxury, commercial, and new construction investments. For more information about Keller Williams San Francisco, visit http://www.kwsf.com/.